Kirk is our newest Advisor in the Cloud Services Practice. He is responsible for helping execute growth strategy for the Mid-Atlantic region and is a big contributor to Motifwork’s Sales/Partner alignment. Kirk is a huge proponent of figuring out how he can improve each day and he thrives on bringing that to his clients. He has a steadfast belief in client success equating to personal and professional growth. 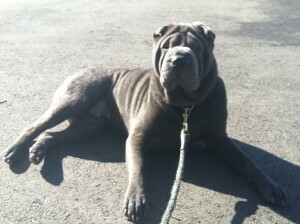 Kirk resides in Philadelphia with his “Rockstar” Shar-pei Truman. We here in the Towson office like to call him “Smooshie”. Truman that is, not Kirk! He has also been referred to as ET, “a bag of towels”, a manatee, a seal, a rhino, and hippo. (Still talking about Truman, not Kirk). Kirk has a BS in Communications from Millersville University and is an electronic music production nerd. When not traveling the world pretending to be an NFL talent evaluator, he enjoys spoken word poetry, anything competitive, Terps Basketball, Michigan Football and the Iggles of course (For those of you not from the area, that’s the Philadelphia Eagles). SurfacePro, Monitor, Mouse. Minimalists Unite! What is your favorite thing about working at Motifworks? The talent and intelligence of our team. It’s a technology company founded and run by technologists. Feeling great and considering how I can improve tomorrow. Willing myself through my first speaking engagement on an IT Executive Panel, smack dab in the middle of the Philadelphia Eagles Locker Room. Surreal experience. The endless possibilities around analytics and machine learning. If you could have dinner with any 3-people dead or alive, who would they be and why? Gregory Pardlo Jr – We haven’t had dinner in a decade or so and a lot of incredible things happened since.